By the last decade of the 19th century, the booming population of Greenwich Village required increased fire protection. In 1891 the city purchased the old rooming house at No. 132 West 10th Street as the site of a new firehouse for Engine Company 18. N. LeBrun & Sons was responsible for the design. Since 1879 Napoleon LeBrun had been designing all of New York City’s fire houses—around 40 of them so far. For this narrow firehouse he turned, mostly, to understated Romanesque Revival. The first floor was composed of rough-cut stone blocks surrounding a cast iron frame for the double wooden truck doors. Above, orange brick was highlighted by terra cotta, with stone trim at the window openings. LeBrun creatively used brown-orange terra cotta tiles, looking much like Lego blocks laid on end, to create handsome pseudo quoins along the sides and an outline above the arched windows of the third floor. Two large foliate terra cotta disks, like sunbursts, embellished the top floor and an elaborately-decorated cornice announced the influence of the new Classicist movement. Engine Company 18 moved into the completed building in 1892. Its horse-drawn engines would be seen speeding through Village streets for decades; often narrowly avoiding street cars, pedestrians and other vehicles. On September 29, 1907 one such run nearly cost fireman John J. Harvey his life. 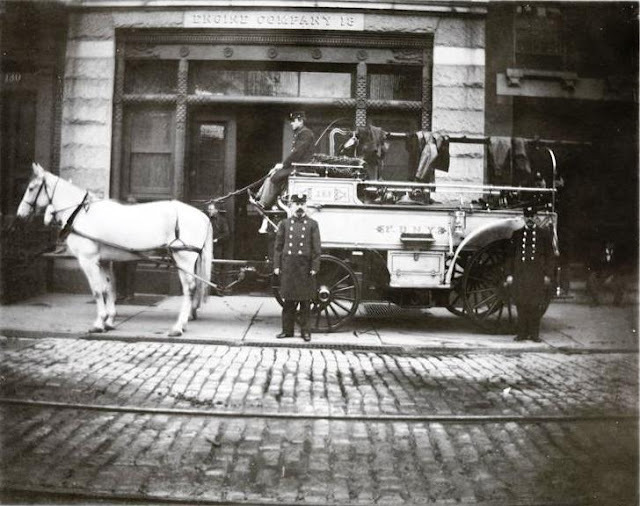 Harvey was riding on the step of the tender, or hose wagon, on way to an alarm at Washington and Christopher Streets. The tender was just behind the speeding engine and both trucks were clanging their bells. In the meantime, motorman Frederick W. Unkelman was running his streetcar along 10th Street without slowing or stopping for the emergency vehicles. Finally, at Washington Street, he paused long enough avoid a collision with the engine; but as it passed he started up again. “When the tender came tearing along in the wake of the engine the driver had great difficulty in steering through the narrow space between the curb and the car. His horses barely got through, but the car, keeping on, swung still more out over the roadway and struck the wagon broadside,” reported the New-York Tribune. The motorman was arrested and, ironically, the call turned out to be a false alarm. Earlier that year, in February, Engine Company 18 had responded to a call that was most definitely not a false alarm. Nearby the old Tracy & Russell Brewery building at 11th Street and Greenwich Avenue caught fire. It was now being occupied by the Manhattan Screw and Stamping Company and the lunchtime blaze spread rapidly. Most of the 300 employees were out at lunch, and those left in the building were able to escape. But the growing inferno was dangerously close to Grammar School 41 with its 1,400 little girl pupils, and the House of Calvary on Perry Street near Greenwich Avenue, a cancer hospital. The one hundred horses in the stables on the first floor of the burning building were rescued; but in the end the building was in ruins—a loss of about $100,000. On August 19, after being escorted by Engine Company 18’s Captain Howard Rusch to observe night court, the French fire chief came back to West 10th Street. Here he “and remained there all night in order to answer all alarms with the apparatus,” said the New-York Tribune. The unit responded not only to nearby emergencies, but traveled across town when necessary. Such was the case on Saturday March 25, 1911 when the Asch Building caught fire. Home to the Triangle Shirt Waist factory, the fire would result in one of America’s worst industrial tragedies with 146 fatalities. The first two decades of the 20th century were plagued with terrorist attacks by anarchist groups like the Black Hand. Business buildings and even apartment houses were targeted for bombings; one of which was thwarted by a quick-thinking Engine Company 18 fireman in 1910. Joseph Halpin, on leave of absence, was passing a building when he noticed a small fire. He entered only to find the structure was filling with gas from open lighting jets. He blew out a lighted candle that was connected to a blasting fuse which led to a bomb filled with gunpowder. The terrorist, Andrea Galasso, had attempted to level the structure. He was sentenced to Sing Sing Prison for four and a half years. Fireman Halpin received a medal from Mayor Gaynor. By the roaring 1920s Greenwich Village was not just the center of bohemian cafes and tea houses; it was still a close-knit neighborhood of families and children. 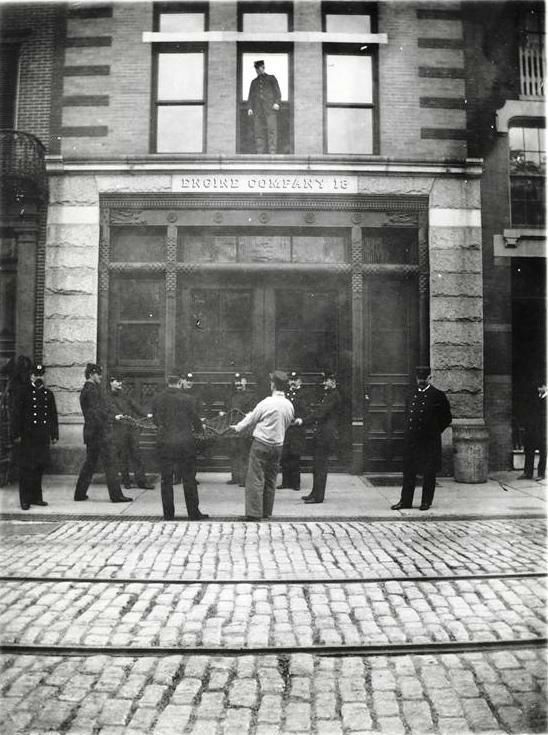 The firehouse on West 10th Street was a familiar summer haunt of the youngsters who “come to the engine house in their bathing suits to prance under the street showers,” said the New-York Tribune in 1921. That was the year that the firemen had an idea. The members pooled $50 of their own money to purchase materials and five firemen—Engineer Patrick Vak and Firemen Peter Brennan, Patrick Foley, Dennis Collins and Joseph Lally—designed and built a “portable swimming tank” for the children. The “perambulating running water swimming tank” was a hit and by the end of July the Tribune reported that “many hundreds of children daily” used the pool. And so the adults wanted to get into the act. As it turned out, the children did not get their tank back and things returned to normal at Engine Company 18. On October 18, 1966 the Engine Company responded to a particularly lethal blaze on West 22nd Street and Broadway. It would be the darkest day for the company to date. The old converted brownstone buildings were engulfed, necessitating a response from not only Company 18, but Engine Company 5, Ladder Company 7 and Ladder Company 2. While the fire fighters struggled with the blaze, the cellar was becoming an inferno, unbeknownst to the crews inside. At the last minute a cry of “get out, get out” was raised, but it was too late. “All at once, with a thunderous crash, a 20-by-5-foot section of floor gave way. There was a burst of flame that rolled along the ceiling of the drugstore and flared out into the street,” said The New York Times. In the worst disaster in the Fire Department’s history, twelve firefighters were killed that night. Of the seven members of Engine Company 18 to respond to the blaze, only two returned; Fireman John Donovan who arrive d late, and Fireman Manuel Fernandez who was connecting hoses in the street. In 1976 the country was taken with renewed patriotism as the nation’s bicentennial was celebrated. For its part Engine Company 18 painted its baydoor—now a single garage-type door that replaced the originals—with a remarkable mural depicting a fire engine heading forward along a red, white and blue path. The vibrant, colorful mural became a Village landmark and the City of New York budgets funds each year for the restoration and preservation of the urban artwork. As terrorism and the threat of hazardous materials attacks grew, the City responded by increasing its specialized units trained in handling hazardous materials and weapons of mass destruction. On July 1, 1998 Engine Company 18 was designated Squad Company 18. It would not be long before the new squad’s training and expertise would be called upon. The tragedy of the fatal 1966 fire was surpassed on September 11, 2001 when terrorists flew airliners into the World Trade Towers. Eight brave men from Engine Company 18 who rushed to the aid of the innocent civilians targeted in the mindless attack were lost. LeBrun’s handsome firehouse is little changed since it opened in 1892. It is a familiar Village landmark that has seen joy and tragedy and, briefly, a few women in bathing suits. In an amazing coincidence, on the day that I posted the above, Alice Lum, who provides so many of my photographs, sent me pictures of the Morningside Heights firehouse. She was unaware that I was writing about the 10th Street house and I was astounded at the coincidence. Thanks for sharing. My pleasure--and that IS an amazing coincidence! Absolutely adore your blog, by the way, which I only discovered a few weeks ago. But even without the classic door (which is upstairs in the firehouse), the building is beautiful--freshly repainted over the past few weeks, with details picked out in black and gold. It's still worth a detour!